Topnotes: cardamom, mandarin orange, pink pepper, wormwood (absinthe). Heart notes: clove, incense, pepper, woody notes, jasmine, rose, white flowers. Basenotes: musk, French labdanum, oakmoss, styrax, leather. A kind friend sent me some of this wonderful fragrance. Earlier, I’d read the words “animalic chypre” and raised my eyebrows, thinking, “Well, I can write this one off the test list.” Animalic chypre is so not my style. In fact, it still isn’t, and may never be – but I’ve come to understand that Memoir Woman is very difficult to classify. Like another morpher, Chamade, Memoir Woman smells very different from top to bottom. 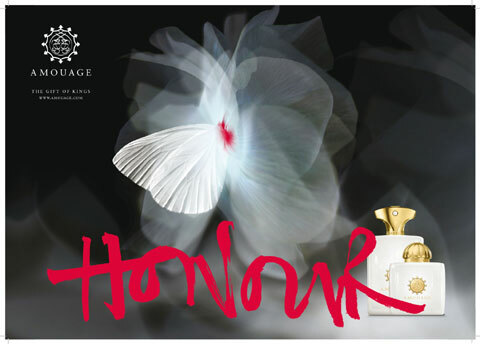 Unlike Chamade, which can be classified as a green floral with an oriental base, Memoir is tougher to pin down. You think it’s going one way, and then you hang a hairpin turn and find yourself somewhere completely different. I first read a review of Lyric Woman over at Now Smell This. It was Angela’s review, and a lovely, singing review it is. I immediately ordered a sample from Aedes de Venustas. It sent me into transports of joy. I had to have some. I managed to join a bottle split, and now Lyric graces the most stellar of my days. Base: oakmoss, musk, woody notes, patchouli, vetiver, tonka bean, sandalwood, incense. In the Perfumes: The Guide review of Amouage Homage, Luca Turin states that Omani frankincense is “the best and most expensive stuff around.” Clearly Amouage has access to really top-notch materials, because there isn’t a whiff of cheapness about Lyric at all. It smells solid, rich, elegant, with plenty of body but no fluff. Its eyes are deep and mysterious; they promise but do not flirt. The entire effect of the scent is that of rose petals and spices smoldering on a wood fire, an intoxicating waft. LT mentions an “overripe, plangent fruity note” that I never get, and I’m wondering what he smells that I don’t, because I’m typically disturbed by overripe fruit (as in Badgley Mischka, Diorella, and Calyx). I have sometimes seen Lyric Woman compared to Caron Parfum Sacre, and on the surface I understand why. Both are opulent and rich and romantic, and share some points of congruence: that beautiful woody rose, the spices, the woods and incense and vanilla/tonka bean. However, to me, Parfum Sacre is much more focused on woods and vanilla under the rose, while Lyric’s rose and incense hold hands. Lyric is far dryer, austere yet sumptuous; Parfum Sacre always strikes me as being as maternal as it is sensual. Parfum Sacre sings to me in rounder, softer, comforting tones, while Lyric is dramatic and demanding of my attention. Parfum Sacre, to me, shifts from stage to stage in its development, from lemon-pepper to pepper-rose to rose-incense-wood to incense-wood-vanilla. Lyric smells not linear, but consistent throughout. I can smell spices and rose and incense all the way through, with only the bergamot and tonka bean dancing onto and off the stage. I love both scents, very much, but for different reasons. Another spicy-rose-incense scent is the dramatic Chanel Coco. However, I have never liked Coco, due to the Youth-Dew accord in its backbone. I was also disappointed in Tauer Incense Rose, which based on the notes should have been something I loved. It just wasn’t, for some reason. Several of the Tauer scents do that citrus-incense-spice combination, and it’s very pleasant, but it doesn’t move me. Lyric glows for me like a dark jewel, like a faceted garnet holding wine-red flashes in its heart. It has the weight and elegance and sheen of heavy satin. It is noble and lofty and graceful, and I think of it as the dark-eyed beauty I often wished to be, when I was growing up with freckles and skinned knees. Other reviews: Angela at NST. Marina at PST. Abigail at ISTIA. Patty at Perfume Posse (brief). Donna at PST. The Non-Blonde. Suzanne of Eiderdown Press. Chandler Burr at the NY Times. Another Perfume Blog. And Tarleisio at Scent Less Sensibilities gives us a Lyric-inspired story that knocks my socks off (go read it – if you don’t know Lyric yet, you will after you read, and if you do know Lyric, you’ll be moved). Image of Lyric Man and Woman from Fragrantica. 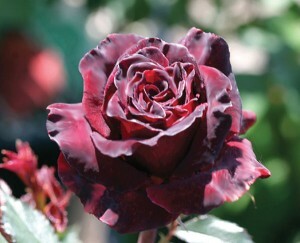 Image of Black Baccara rose from Heirloom Roses. 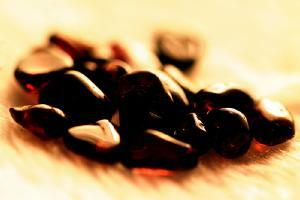 Image of polished garnets from Flickr.